As you're driving around town today, you may find yourself asking these questions: Why are they sold out of astroturf at the hardware store? How did this cello end up in the street? Who are these people doing yoga in my parking spot? Welcome to the ninth annual Parking Day. 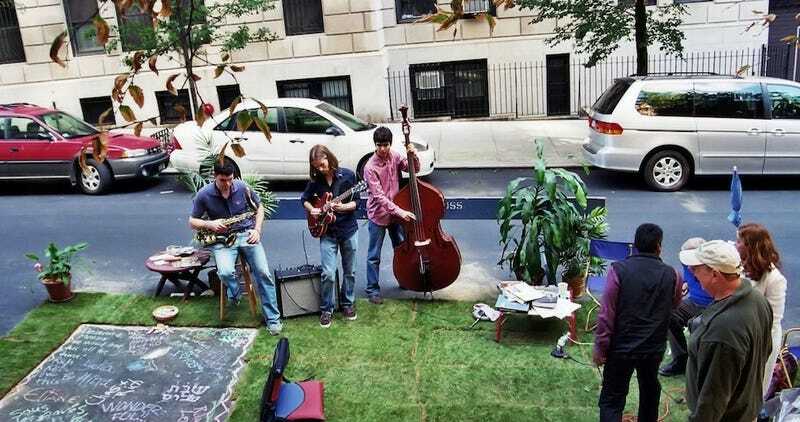 Parking Day (or, one of the preferred excessive punctuation variations: PARK(ing) Day or Park[ing] Day) is an annual event where people all over the world transform metered parking spots into mini parks for the day. The idea is to highlight the prevalence of car-centric asphalt in our cities by turning a parking space into public space. Get it? Parking Day! Parking Day began in 2005 when the San Francisco architecture firm Rebar converted a parking space near their office into a park (above). It was meant to be a one time thing, they say on the Parking Day website: "Our original PARK stood in place for two hours—the term of the lease offered on the face of the parking meter. When the meter expired, we rolled up the sod, packed away the bench and the tree, and gave the block a good sweep, and left." Photos of the park went viral and Rebar began fielding requests from cities around the world asking to recreate their idea. Rebar turned it into an open-source project, created a manifesto and how-to, and gifted the concept to the world, declaring the third Friday of September as Parking Day. Park creators map their own projects and share their photos of the day. In 2011 there were reported to be 975 temporary parks in 162 cities. Some of them are super creative. Parking Day is really fun. You get to take the day off and sit on a piece of turf on the street, sipping lemonade and petting baby goats and blogging about how you're sitting on a piece of turf in the street, sipping lemonade and petting baby goats. I totally agree with the subversive nature of Parking Day: The absurdist visuals created when people erect temporary swimming pools on a busy thoroughfare, the weird conversations you have when explaining to people why you're lugging potted plants down the sidewalk. These are all good things. But they're not where we should be focusing our efforts. Parking Day has been very successful in launching a global conversation about the lack of parks in our cities. It has even lead to some permanent parks inspired by the Parking Day movement. But I think designers, architects and public space advocates should spend today doing something else for their city—and here's why. It's dangerous. You are standing in the street with a $5 trellis from Home Depot between you and a car going 50 miles an hour. Dude, someone is gonna get killed. It's not always city-appropriate. In some cities, the blight created by one parking space is the least of their urban design worries. By making the conversation all about cars, it's excluding some of the bigger environmental, social and economic issues that are facing our cities. It's not original. The Parking Day concept is simple and powerful. That's why it resonates. But why would you want to copy what hundreds of other people are doing when you can come up with something unique and attention-getting for your own neighborhood? There so many great examples of "tactical urbanism" out there—this exhibition Spontaneous Interventions has 124 of them, including Parking Day—that people who want to do this kind of thing should be inspired to come up with something new. It's illegal. Every year I hear more and more stories from park creators who are getting their parks shut down by local law enforcement. I know, that's the civil disobedience aspect of the project (and that's what makes it fun!). But I am pretty sure it is not okay with your friendly neighborhood policeman to be standing in traffic doing yoga. How long before we see a Parking Day participant ticketed or hauled off to jail? It's show-off time for architects. Sadly, even though designers are supposed to be creating these parks for the good of the city, many architects use the opportunity to promote their firms and themselves by building ridiculously over-the-top concepts that are in no way functional as actual parks. It's a portfolio piece masquerading as community service. It's already worked. Cities around the world are turning streets back into pedestrian zones. From New York City to Los Angeles you can find parks made from parking spaces. San Francisco, where Parking Day started, now counts dozens of parklets, street plazas, and street-to-park conversions as part of its Pavement to Parks program. There are even toolkits for developing parklets, like this one from UCLA [PDF]. Public space advocates can take one of these toolkits and adapt it to their own city. The parking lot has now become a park. Let's move on to the next challenge. It's time better spent working on an actual park. Want to convert a parking space into a park? Great! Why not spend Parking Day designing a concept, brainstorming funding sources, reaching out to your local government officials? I guarantee that if those 975 park creators from 2011 spent their days and resources working on a permanent public space, we'd have at least a dozen of those parks already become a reality. And I could be enjoying this beautiful last day of summer by blogging from one of those parks instead of sitting here ranting your ear off about Parking Day.